Cutting down a mature tree can be a dangerous thing to do, so it should be handled by properly trained and equipped professionals whenever possible. 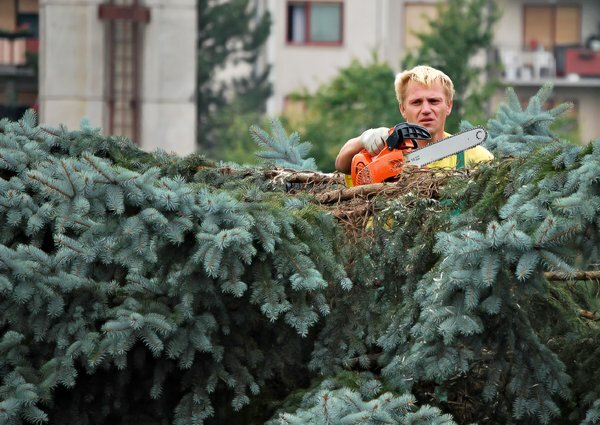 If you are unable to hire a professional and need to fell the tree yourself, then these tree cutting tips may help everything go smoothly. Before you start down the path of learning technique, you need to have the right equipment for the job. Your equipment should all be in good repair and you should test it before using it on a tree. The following list covers the main pieces of equipment that would be needed to cut down a mature tree on your property. Chainsaw: This is perhaps the most important piece of equipment you’ll need. The chainsaw should have about 3.5 horsepower and it should have a 20 inch bar. The bar length indicates the depth that the blade can penetrate, so 20 inches should be enough to cut down most trees. Safety Glasses: Many people overlook the importance of using safety glasses when doing work like this. However, the truth is that flying debris can seriously harm your eyes when cutting with a chainsaw. Leg Protection: If you hit a knot in the tree, then the saw can kick out of the tree and hit you in the leg. It is recommended that you use either knee-high safety boots or wear heavy leg protectors. 1000 LB Test Rope: The rope should be roughly three times longer than your tree is high. It will be used as a safety backup in case there is an issue. There’s a lot of bad advice here. “Based on the height of the tree, decide on the direction you want the tree to fall.” – there are a lot more factors then the height of the tree. The main factor being the lean of the tree. You need to factor the trunks integrity, weight distribution, ground obstacles, hydro/utility proximity, underground utilities, branch entanglement, and many other things. Certainly not just the height. In an urbanized environment, many trees cannot be dropped from the ground, they need to be pieced down. “Tie one end of the rope to the tree at either the middle or above the middle” – use a knot that can bear the load (usually a bowline or running bowline.) Where you tie it depends on a number of things. You don’t want to tie it at half way if you’re over coming a back lean. The higher, the more leverage. But also, the higher you go, the smaller the limbs girth gets. Make sure to tie somewhere that has enough strength to handle the horizontal force you’re applying to it. “Cut a v-shaped notch into the tree on the side you want the tree to fall” – there are a variety of types of notches and you should know what type to use for which situation. Also, make certain to cut your notch into an area that has sound wood. You’re going to want to have significant holding wood on both sides. “The notch should be at roughly knee-height, should cut to the center of the tree and should look like a shallow “v”.” – I guess you could do knee high but I would personally recommend more waste height as its easier to set up a nice hinge. 95% of the time, your notch won’t make it anywhere near the half way point. There’s other issues too, but I’m getting tired… Cut safe !! !